Militants have carried out a series of gun and bomb attacks in the heart of the Indonesian capital of Jakarta on Thursday. According to reports, the attacks appear to be a coordinated but no one has taken the responsibility so far. Media reports say 10 to 15 attackers entered the city on motorcycles, armed with guns and explosives. Hundreds of police personnel reportedly took to the streets of Jakarta. 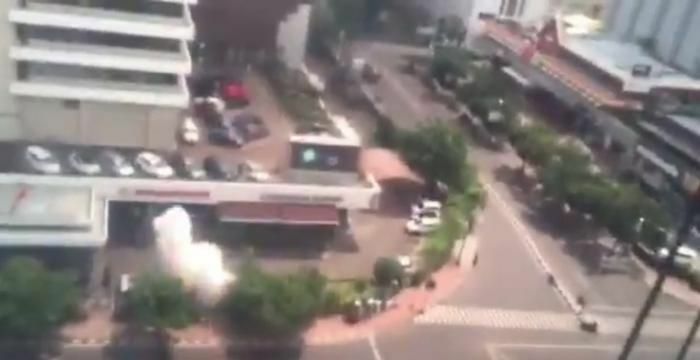 A Starbucks outlet close to the Sarinah mall was reportedly the site of a suicide attack. A video posted on Twitter chronicles the seconds before the explosion.